All related features are grouped into categories. For each category, you have a page: just click a ribbon and a button to instantly access to the category you want. You can resize or even maximize the main window if you want. All controls will automatically be adjusted. At any time, just press F1 or click Help to instantly access the comprehensive and detailed help documentation. It is context-sensitive so the related help topic is immediately displayed. Easily manage files to be compiled in ebooks as in Windows Explorer: HTML Executable lets you add multiple files, entire folders or wild cards, or you can use drag/drop operations to add your files directly from Windows Explorer. Adding, removing files is really easy with the buttons or the mouse context menu (right click). Let HTML Executable automatically manage and update the files that should be compiled thanks to the Source File List Update feature. Projects can of course be loaded and saved. Moreover, HTML Executable supports command line options (switches) and batch builds. HTML Executable has batch options for creating ebooks: you can write a text file with instructions (called directives file) and pass it to HTML Executable. Your ebooks will be automatically created. A detailed log is always displayed after compilation. It includes some animated tutorials to get you started and to show you the steps for creating publications in seconds. A main demonstration, several skins and resources are also available. You can, moreover, download more resources from our Downloads section. And much more. 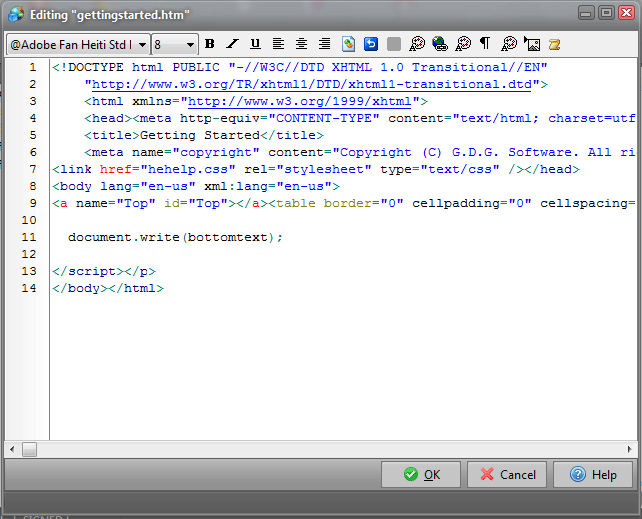 Grab your copy of HTML Executable today and see for yourself! The Trial edition is fully functional and does not have any time limit itself.